The most pertinent question to ask of ourselves at the outset of discussing fictional works by Moore that deal in some way with magic or even the occult is “what is the difference between a literary tradition of magic and ‘real’ magic?” By this, I mean that we must draw some lines in the sand between the history of magic seen through the eyes of literature as a series of tropes that writers inherit, and the kind of “real” magical practice and beliefs certainly espoused by Moore from 1993-94 onward. It is the difference between literary traditions of the exotic West Indies and the realities of Islander life in the past and today. Literature is a lens with its own particular stereotypes, traditions, and obsessions. It is not the case, however, that “literary” magic has nothing to do with Moore and that “real” magic does. Both impact his work, particularly his early work, in which he inherits traditions from particular comics universes. In Saga of the Swamp Thing, Moore inherits the DC Universe, in which the supernatural already has a long history, and it is up to him to determine what to do with that “magic” tradition largely informed by Western literature’s motifs and conceptions. The associations that spring to mind when one thinks of “magic” in comic books before Swamp Thing (and many afterward too) is probably exactly the literary tradition at hand here. There are two types of magician, for instance: the patrician, gaunt, slightly sinister magician in tuxedo and top-hat (whose images is partly derived from stage performing magician-illusionists); and the hale, shamanic, wizened, “good” sorcerer in touch with the natural world (whose image is loosely cognate with Prospero from The Tempest). If these dualities remind you of feminist criticism, wherein we are directed to identify the “seductress” with infernal traits and the “saint” who is maternal and virginal, as limiting and controlling categories for female characters, you are right on the money. The same extremes have been applied to depictions of magic in literature, with the same unsavory results. It would be particularly easy within the medium of comics to fall into perpetuating these stereotypes, particularly when dealing with minor “stock” characters. Alan Moore, however, resists this simplicity when handling “literary” magic from the starting gate, and this suggests a particular interest of his, not only in the material but in the potentials of the medium to express a greater depth of characterization. “So we started to build up the supporting cast, Swamp Thing’s relationship to the DC universe — that was something that I was very concerned to establish because it struck me that Swamp Thing was fairly marginal. Swamp Thing and the other supernatural characters — of which there were very few left by the time that I started working on Swamp Thing — I think Swamp Thing was about the only supernatural title left” (qtd. in Khoury 88). 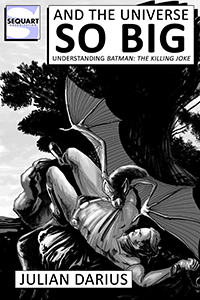 The “supernatural” elements that Moore felt could re-establish the series within the DC Universe had a close relationship to the horror genre, itself marginal in comics at the time. Saga of the Swamp Thing became a kind of “catch-all” for marginal genres within comics, but in the hands of Moore, this became an asset rather than a debilitating feature. He realized that the way to preserve “seriousness” and readership in Swamp Thing, despite its often intentionally irrational premises, was to carefully preserve continuity with the previous series, being sure not to “destroy[ ] the reader’s accumulated trust in the narrative” (qtd. in Khoury 86). This meant that any changes Moore needed to make in story and character had to be scrupulously “logical,” looking for “loopholes” to allow reinterpretation, such as the redefinition of the Swamp Thing character as a plant that only thought it was Alec Holland (qtd. in Khoury 86). Another way to reign in the fantastic elements of a supernatural horror series and create continuity was to fully exploit the benefits of a “location.” Moore decisively latched on to the Louisiana setting of Swamp Thing in order to get interesting images or atmospheres from it”; he continues to feel that, as a writer, “if you don’t use the location, you’re wasting a tremendous resource” (qtd. in Khoury 86). The use of a rich and inviting location setting in Swamp Thing is probably one of the most recognizable features of the series to readers today; this might not have been the case, of course, if not for the highly sympathetic artwork produced by Stephen Bissette, John Totleben, and, later, Rick Veitch, who conveyed a” kind of frenetic, organic quality… perfectly suited to the kind of fetid, steaming swamp environments that the character was most used to” (Moore qtd. in Khoury 91). If not for the “organic” physicality that the Bissette and Totleben infused into the series, the horror elements of Swamp Thing would be far less visceral and disturbing, and it would be much more difficult for readership to “suspend” their “disbelief” in the series’s intrinsic supernatural elements. 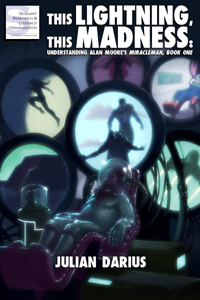 When Moore calls the more remarkable elements of the series “phantasmagorical,” he positions the comic in the field of performance and, specifically, within the experience of the spectator / reader (qtd. in Millidge 116). Phantasmagoria is a theatrical tradition implementing a magic lantern shadow-show to project frightening images onto a wall or surface. The technology, developed during the late 18th century in France but spreading throughout popular culture in the 19th century, enabled the projectionist to give the impression of demons, ghosts, skeletons, and the like pursuing the audience. The remarkable element here is audience cooperation. Phantasmagorias were shows paid for my attendees and often staged in “creepy” locations like catacombs, nevertheless, with full disclosure about their artificiality. Only on rare occasions did audiences become convinced that what they were seeing was real. They desired a semblance of real experience, and they got what they paid for. Later in phantasmagoria tradition, the methods were employed for trickery, particularly in the staging of séances, wherein the participants might be unaware of the use of magic lanterns, giving the term “phantasmagoria” a greater sense of uncertainty and wonder. There are substantial reasons why the concept of “phantasmagoria” has bearing upon Moore’s Swamp Thing and, indeed, comics in general. 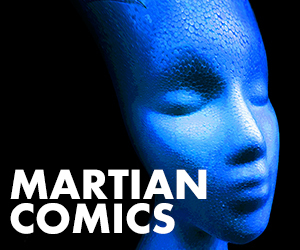 Illusion is part of the construct of the comic. Horror is designed to produce certain reactions in the reader, and that is expected from the genre, even while contained by a recognized format like a comics panel. The wider the net of visual information cast over the reader or audience, however, and the more overloading the sensory detail, as in Bissette and Totleben’s crowded panels, the more likely that the “illusion” will take over and the reader will feel they have fully “experienced” the performance. When one hears Moore use the word “phantasmagoria,” and we consider the performance associations of the term, it is difficult not to think of Moore’s own performances and the ways in which sensory detail contributes to magical experience. This is particularly the case in Moore’s first performance with the Moon and Serpent Grand Egyptian Theatre of Marvels, which utilized visual elements, sound, and location so strongly. Looking back on it, Moore admits “the first one — because we did not know what we were doing — is perhaps the most incoherent. I was talking about Magic when I hadn’t got the faintest idea what I was talking about” (qtd. in Millidge 109). He feels that they were “inventing the form as [they] went along” and that they progressed toward greater sophistication in later performances (qtd. in Millidge 109). The fact that Moore states that he was “talking about Magic when [he] hadn’t got the faintest idea” is interesting in itself; however, the lack of sophistication in this initial performance is not entirely regretted by Moore. He also says that the performance, for this very reason, had an “eerie power.” Moore points out that “when we made less sense” the performance was full of “more powerful material, more genuinely magical material” (qtd. in Millidge 109). In fact, it is a state that he hopes to return to in the future, when dealing with performances. When we consider Moore’s intentions in working with the Moon and Serpent Grand Egyptian Theatre of Marvels, to present this basic magical “experience” for the audience, we venture nearer to the goals of phantasmagoria. The “psychedelia” of Moore’s performances, already noted as a feature in Swamp Thing, depends largely on the forms of information provided at once. Moore comments: “the mind of the audience is taking in more information every second than it can handle,” causing “a kind of fugue state where there are too many vectors of information occurring at once” (qtd. in Millidge 108). In the absence of logic and the ability to filter this overload of information, “the mind tends to just give up and be carried along by the flow,” thereby “soaking up all the emotion and general feeling of the thing” (Moore qtd. in Millidge 108). Swamp Thing, with its “fetid” but generative atmosphere, is very much about creating a “state of mind” in the reader in the same way that phatasmagoria and Moore’s performances have that goal. The reader who picks up the comic knows that the horror elements contained within the pages are not “real,” and, yet, the illusion of their reality is desirable. Neither Moore’s performances nor the comic Swamp Thing are that far removed from an atmospheric magic lantern show geared toward altering your perception of reality. Virtually every page of the series could be used as an example of the phantasmagoric horror elements that drive it, but let’s look at one strong example to notice the use of sensory detail. It is important that phantasmagoria creates an atmosphere of the unfamiliar, contains visual “evidence,” and suggests the involvement of other senses. In fact, later phantasmagoria shows used sound effects as well as location to increase the sense of reality. In issue #26, “A Time of Running,” a shape-changing Monkey King creature fed by fear is tormenting Abby Cable’s workplace and, later, her own mind. When Abby and Swamp Thing confront the creature, they hear wailing, depicted in large font and multiple colors, witness doors shattering toward them, and then hear its hideous voice (1.145.1-2). At this point, Moore chooses to break into a narrative voice that is more generalized than Abby or Swamp Thing’s perspective. The narrative describes even greater sensory detail that is then portrayed in dialogue-fashion through the illustration. Meanwhile, speech and sound effects are depicted, creating a third layer of information. Finally, the layout of the page is highly experimental, presenting overlaid, fragmentary angles that gradually guide the reader from left upper to right lower in a cascade effect. There is a monumental amount of information conveyed in a single page, a direct attempt at sensory overload only reinforced by the strong sense of the “unfamiliar” embedded in the artwork that presents a melting, childish figure, an insubstantial, monstrous beast, and finally the screaming faces of both Abby and Swamp Thing. It is rare to see Swamp Thing so rattled, and it increases the tension in the page. Moore’s guiding narrative is particularly sensory in nature: “Its voice is a slurred and mindless parody. Its features are slack and hardly formed,” and “Its shape flows, a viscous nightmare of liquid flesh. Its voice speeds and slows and changes. The children scream, the monkey screams…” (1. 145.5). This page alone comes close to Moore’s later performance goals to focus on the “emotion and general feeling of the thing” to create an alternative state of mind. To call the Swamp Thing series a “horror show” or even a “freak show” is not a misnomer. In fact, the goals of the series seem to go back to the earliest forms of horror showmanship. It is fair to say that the earlier issues of Moore’s Swamp Thing are actually engaged more fully with phantasmagoria than later issues. As the series progresses, bringing in the features of other genres, phantasmagoric qualities fade a little to be replaced by a consistently firmer fixture: the occult. The occult elements of Swamp Thing are present from early in the series but gain more of a dominant role in the text as plotlines develop. Under the umbrella of the occult, we find many varieties of “literary magic” as well as a host of inherited DC supernatural figures that Moore wished to rehabilitate and integrate into Swamp Thing’s world. Neil Gaiman’s helpful introduction to the collected second volume of the series lays out the contributing ghoulish characters reintroduced by Moore. These include “four displaced spirits” who guide Swamp Thing when he journeys into hell to rescue Abby: Deadman, a.k.a. Boston Brand, who seeks revenge for his own murder; the Demon, a.k.a. Etrigan; the Phantom Stranger, an “ambiguous” character who here becomes an “agent of Cosmic Balance”; and the Spectre, a.k.a. Jim Corrigan, once a murdered policeman now fighting crime on Earth (2. 7-8). Let’s add to that list Abby Cable, an Arcane with her own strange supernatural inheritance; and finally the remarkable new character John Constantine, created by the Moore and company for the series. Though none of the previously existing characters had their own series any longer, they were all appropriate “resurrections” to populate the occult world of Swamp Thing. If phantasmagoria is about the senses, the occult, as “literary magic” in Swamp Thing, is about cosmology and agency, or the arrangement of the universe and how one acts upon it. Moore was intrigued by the possibilities of sketching out the confines of an occult universe in Swamp Thing to match some of the features suggested by other DC titles over the years. He came up with following basic questions to answer: “What’s the setup in Hell? And how do all these places stick together? Can you get from one to the other? What route do you take?” (qtd. in Millidge 91). In Moore’s own words, those working on Swamp Thing were “trying to do a preliminary map — a rough map — of the DC supernatural territories in that issue. And it was a lot of fun”(qtd. in Millidge 91). Though the similarity, according to Moore, was not intentional, Swamp Thing Annual #2, “Down Among the Dead Men,” traces the “map” of the occult universe in a similar vein to Dante’s Inferno. In truth, Moore is drawing on a strong tradition in Western culture to “map” the spiritual realms, going back much further than Dante. Like Dante guided by Virgil, however, Swamp Thing is guided through the mysteries of the spiritual universe in search of his own Beatrice, or perhaps, to use a more mythical model, like Orpheus seeking Eurydice. If a knowledge of the occult can help guide you in your spiritual “travels” and keep your soul, or the souls of those you love, safe, agency is also helpful. In the context of the occult, agency means magical power of some kind to affect the occult universe. Swamp Thing’s powers are mystical but tied to the mysteries of organic life and death, and it is initially unclear how he will fare in the midst of greater mysteries without the agency of others. Swamp Thing clarifies this uncertainty to the comatose, soulless body of Abby Cable “you have been cast into regions… where the wearing of the flesh… is proscribed… and I am shackled to this body”(2.103.4). The challenge of this situation leads him to reinterpret his own agency, and hence discover his broader role in occult terms, musing “I can go… beyond my body… can I go beyond death?”(2.104.1). In keeping with the whole “evolutionary” trend pursued by Moore in the series, Swamp Thing moves closer to his identity as a “vegetable god” when he realizes that he has some degree of agency in occult terms (qtd. in Millidge 89). By crossing the threshold of life and death, Swamp Thing essentially becomes an occult figure himself. On this journey of lost souls to find Abby, the rhyming demon Etrigan, particularly, engages with the occult “rules” of the underworld and uses magic to secure the release of his party members. Though he is a DC figure with a literary heritage, he is hardly a stereotypical “magician” figure, neither a sleek stage performer nor a Prospero. He instructs Swamp Thing and Abby to “Climb! Though I may remove you from this place, the magicks used require both time… and space!” (2.136.4). Later, he continues to deal with the underlying rules of the universe in almost mathematical terms, expressing his own magical agency: “Be still! ‘Tis space itself I seek to rend. One slip may tear the cloth from end to end!” (2.137.3). He calls on “quantum imps” and swears “by roots of minus nine and circle squared” making clear that he does not fit typical, inherited magician roles (2.137.4). As usual, Moore brings in his own interpretation of what magic is and what is can do, in this evocation of occult powers: science and magic lie close together. What is noteworthy is the fact that he produced this characterization of Etrigan nearly ten years before he pursued some similar ideas through establishing a magical belief system. Khoury, George, ed. 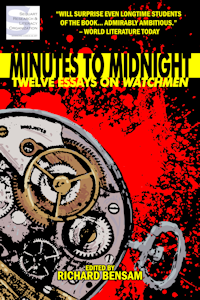 The Extraordinary Works of Alan Moore: Indispensible Edition. Raleigh, NC: TwoMorrows Publishing, 2008. Millidge, Gary Spencer, and smoky man, eds. 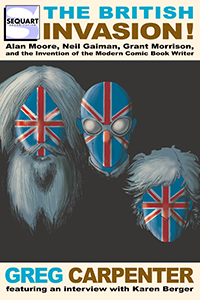 Alan Moore: Portrait of an Extraordinary Gentleman. Leigh-on-Sea, UK: Abiogenesis Press, 2003. Moore, Alan. The Moon and Serpent Grand Egyptian Theatre of Marvels. Ed. Glycon. Accessed 6/6/2012. Available from: http://glycon.livejournal.com/6905.html. Moore, Alan (w.), Stephen Bissette (p.), John Totleben (i. ), Tatjana Wood (c.), Todd Klein (l.). Saga of the Swamp Thing Volume 1. New York: DC Comics, 1987. Moore, Alan (w.), Stephen Bissette (p.), John Totleben (i. ), Tatjana Wood (c.), John Contanza (l.), et al. Saga of the Swamp Thing Volume 2. New York: DC Comics, 1990. Moore, Alan (w.), Stephen Bissette (p.), John Totleben (i. ), Tatjana Wood (c.), John Costanza (l.), et al. Saga of the Swamp Thing Volume 3. New York: DC Comics, 2000. Tagged Alan Moore, John Totleben, magic, Meet the Magus, Stephen Bissette, Swamp Thing. Bookmark the permalink. Hannah Means-Shannon is a comics scholar, medievalist, and the Editor-in-Chief of BleedingCool.com. She has published articles on the works of Alan Moore, Neil Gaiman, and Grant Morrison in the International Journal of Comic Art, Studies in Comics, the Journal of Graphic Novels and Comics, reference books, and upcoming essay collections. She is working on her first book for Sequart Organization about Alan Moore. She is @HannahMenzies on Twitter. See more, including free online content, on Hannah Means-Shannon's author page. I like your idea of Swamp Thing (the comic and the character) being representative of evolution. I always read the series as if it were structured as tree-rings. It grows outwardly in a similar manner and grows into the world naturally.